On this date in 1996, Muammar Qaddafi’s Libya massacred hundreds of prisoners in mass shootings at Tripoli’s notorious prison Abu Salim. Human Rights Watch has charged that the death toll might surpass 1,200 although the government’s long-term stonewalling has helped to obscure the scale. The day prior, inmates had seized a guard to protest poor prison conditions. Qaddafi’s own brother-in-law Abdullah Senussi was dispatched to negotiate a settlement. It was a simple arrangement: release the guard. Have some grievances redressed. The guard was duly released, in good faith. soldiers in khaki uniforms fired upon the prisoners in the courtyard from the rooftops with automatic weapons and then followed through with pistols, individual shots, and killed what he claimed were 1,200 of his fellow prisoners … the number came to him based on the amount of meals he said he had prepared prior to the incident, and thereafter. Senussi, who was Qaddafi’s spy chief, was at last notice under sentence of death himself in post-Qaddafi Libya. 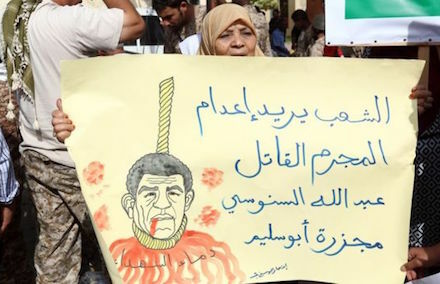 “The people want the death penalty for Abdullah Senussi for the Abu Salim massacre” reads the poster, according to the BBC.